What is Crystal Cave Bama? Located approximately 45 kilometers from Bama Town, Crystal Cave offers the growing stalactite, stone flowers, stone pillars, stone curtains, stone waterfalls, as well as crystal deposits, such as crystal flowers and the like. The 280-million-years-old cave offers countless incredible natural growing attractions to visitors to explore. Most of the visitors to Bama County are always interested to discover Bama Longevity Village, wanting to find out the reason why the villagers have a long life. In addition, Bama has a newly developed attraction which is getting more and more popular among locals and visitors. It is called Crystal Cave. Crystal Cave is the only one cave with the growing stalactites in different shapes and the growing non-gravity crystal deposits found across China until now. It has been proven that the growing stalactites are over 300 thousand years old. The area open to visitors is about 1,500 long, 8 - 50 meters wide and 10 - 80 meters high. Crystal Cave offers 5 halls to visitors to discover. Once entering the cave, visitors will be shocked at the power of the nature. Its white and see-through stone flowers and stone hairs can offer visitors a one-of-a-kind experience. Rent a vehicle departing from Nanning. This is the quickest and most direct option. If you depart from Nanning, please take a direct bus from Nanning to Bama. Then take a bus from Bama Bus Station (巴马汽车站) to Jiangzhou (江州) and get off the bus at Crystal Cave. Please visit the cave based on the visiting orders on the signs of the cave. Please stand on the blanket to visit the cave. You are not allowed to touch or even break or collect the stalactites. If one kilogram of stalactites is broken or collected by the visitors, you will be fined 10,000 CNY. It is not allowed to use flashlight when you take photos in the cave. Please take photos of the figures at the designated area. Please don’t shoot DV, series or movies unless you get the permission to do that. There is no restroom or smoking area in the cave. If you are found to smoke in the cave, you will be fined 200 CNY. You are not allowed to climb the fence. You must be responsible for your climbing and are fined 200 CNY. Babies are not allowed to visit the cave. Those who can’t take care of themselves should be accompanied by their guardians. The guardians shall be responsible for their behaviors. The road in the cave is narrow and wet. Please watch out during the visit. Opening hours: 08:30 - 17:30. Interested in visiting Crystal Cave Bama on a Tour? 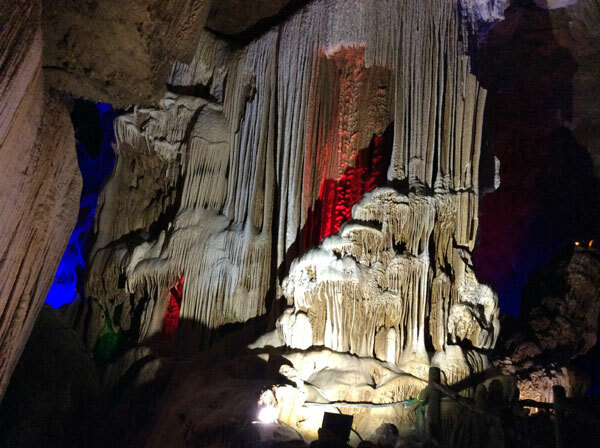 Wendy Wei Tours offers a variety of different packaged tours as well as custom tours including Crystal Cave Bama, among other attractions and destinations. To find out more, please visit our Tours page or Contact Us directly to find out more.